Henry Lipkis stands next to his mural. Photo by Noé Cugny. 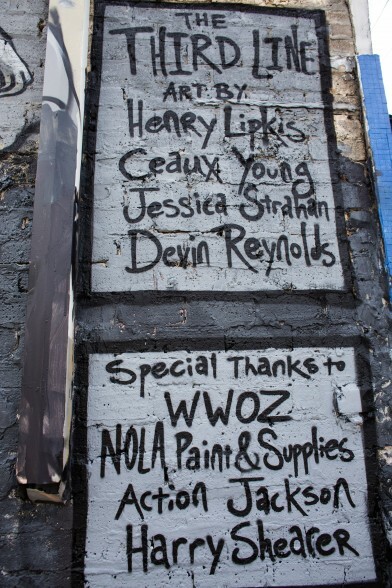 Artist Henry Lipkis’ second line mural, located at Saint Claude Avenue and Franklin Avenue, is now complete after nearly a year of work. 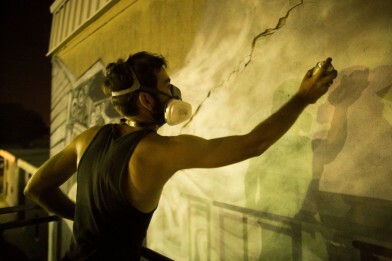 Henry Lipkis puts finishing touches on the mural. Photo by Noé Cugny. The massive art piece, titled “Third Line,” covers a 150-foot-long, 35-foot-tall wall. It depicts members of the community who all play different roles in a traditional New Orleans second line. Among those represented on the wall are Big Chief Demond Melancon, Cheeky Blakk, members of the Buffalo Soldiers Riding Club, TBC Brass Band sax player Brandon Franklin–who was killed in 2010–and a rider from the Caramel Curves all-female motorcycle gang. 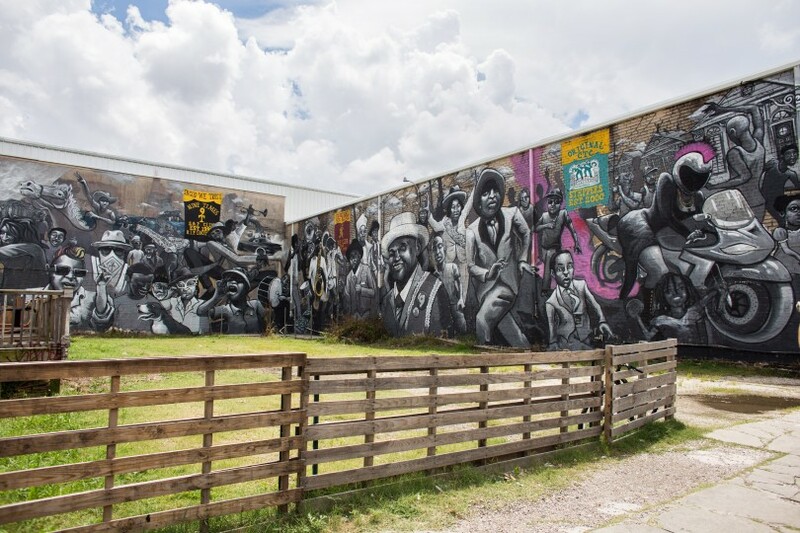 Notably, the mural features members of the three Social Aid and Pleasure Clubs that second line down Saint Claude every year, with Laurence Dunbar of Nine Times, Robert Starks and Ronald Lewis of Big Nine, and Andrew Johnson of CTC all appearing in the artwork. Also represented in the mural is Action Jackson, the WWOZ DJ who specializes in Social Aid & Pleasure Club activity around the city. Jackson was instrumental in bringing this project to life, helping Lipkis to meet and familiarize with different members of the community and Social Aid & Pleasure Club circles. Jackson and Lipkis are organizing an unveiling block party on Sunday, June 5 to celebrate the completion of the project. People from the neighborhood and beyond are expected to gather at 5 p.m. in front of the mural, some of whom will no doubt see their own likeness on the wall.